The WFTDA recently made official what had been known since February. With updates to the its pre-game equipment protocol, gear checks of skaters by officials will no longer be mandatory before WFTDA or MRDA sanctioned play. Teams and officials can still use them before games if agreed upon, but the WFTDA has decided they are no longer necessary to protect itself for liability considerations. Reaction to this news was surprisingly mixed, with three different takes on it. The majority opinion appears to fall in full favor of the change, with most skaters and officials for it, to varying degrees. The other two camps were against it, but for two different reasons. From what I’ve seen on social media, some have cited times where a player’s equipment was poorly fitted or in a dangerous condition, and that the gear check prevented that player from being a danger to themselves or others. Fair enough. Comment from discussion WFTDA Update: Pre-Game Equipment Check no longer a requirement. Basically, these types fear that by making the equipment check optional, but not explicitly unnecessary, they will be the ones saddled with the burden of ensuring a skater’s gear is safe and the liability of what happens if it is not, even if they don’t check it, absolving the WFTDA of this responsibility. People who are claiming this are missing bigger point. The “because it’s safer” conspiracy theorists are also completely disregarding the most important thing about gear requirements and gear safety. Their errant views can be summed up perfectly by James “L8R SK8R” Litvak, founder and former administrator of Roller Derby Rule of the Day, retired skater and referee, and friend of RollerDerbyNotes.com. He posted his opinion about the change on Facebook, which summed up the situation perfectly. He didn’t mince words about it, either. His observation is spot on. It’s silly that he was asked to be the final authority in skater safety as an official in one game, but then be told he is not responsible enough to care for his own safety while playing in another game. If the powers that be couldn’t trust him to check himself, why did they trust him to check others? Sensibly, the WFTDA realized this contradiction and eliminated it with the protocol change. Indeed, the crux of the issue is about safety and liability. But not in the way some are seeing it. There are liability considerations here, but if anything the change would better protect referees from possible legal ramifications. The most obvious benefit of the change is that it relieves refs of a duty that they may not have been qualified for. A ref’s job is to uphold safety through rule enforcement during a game, which they are trained for. 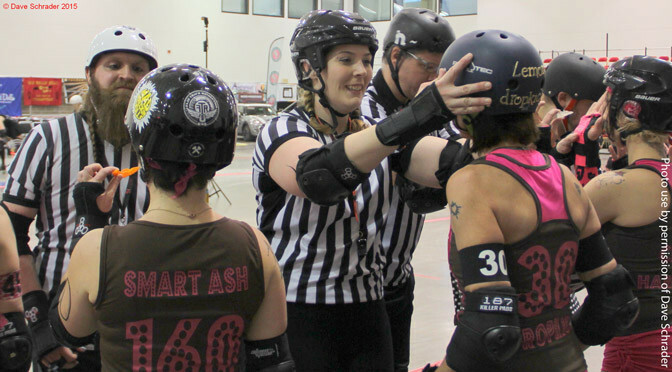 If a player makes their way on to the track for a jam without all their safety gear, or removes it during gameplay, the officials have a responsibility to call illegal procedure on the offending player.1 As long as referees are properly doing the job that WFTDA rules require that they do, they are protected from a liability standpoint. It is not a referee’s job to make sure someone they may have never met before is wearing safety gear to their personal level of protection. 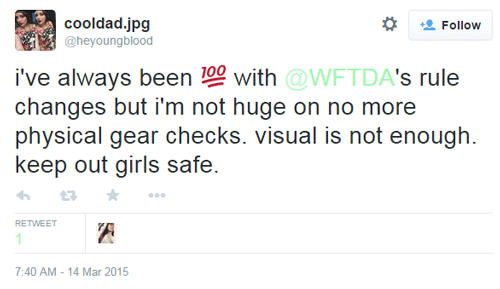 WFTDA officiating clinics don’t have classes on the proper fit of safety gear, and yet the WFTDA was tasking certified refs to check exactly that. Those more concerned that nixing gear checks might compromise a league’s liability or let the occasional unsafely geared player into a game do not realize that the WFTDA Safety Protocol (PDF), which must be complied with to maintain WFTDA insurance coverage2, makes it plain as day as to who is liable for skater safety. 4.2. Gear must be well fitting, worn correctly, and in good condition. Proper fit and maintenance of gear is the responsibility of the skater. With mandatory gear checks, the WFTDA was effectively saying that the final word on skater safety came down to the officials, not the skaters. The check indirectly reinforced the notion that gearing up properly wasn’t really that important, because there would always be a referee to catch anything a player may have forgotten before the game started. In reality, safety should be the first, second, and third things skaters practice before they even step out onto the track for a competitive game, a scrimmage, a practice, or even while messing around on roller skates for fun. If things reach a point where a skater is has ill-fitting or missing equipment at game time, that’s a failure on the part of the skater’s coach, her captain, and herself. Many players playing roller derby still don’t have complete information when it comes to proper fit, use, care, and importance of protective gear. Those not affiliated with the WFTDA but use its rules and follow its guidelines, including smaller local leagues that are predominately self-coached and self-educated on safety, make up a good number of these skaters. That’s too much of a coincidence. These simply must be related to each other in some way, if even partially. Reducing the number of preventable accidents (and claims against their insurance) appears to be the underlying motiviation behind this change. Ultimately, the WFTDA is banking on the community, as it always does, to get the message and act accordingly. You can tell from the very first lines of the new Pre-Game Equipment Protocol document (PDF) that the WFTDA wants to make sure skaters are fully aware they need to start taking better care of themselves. That the doc targets what skaters should do for self-verification of gear, as opposed to what referees should do to skater gear as was in the old protocol, only backs this up. The only question is whether or not there are enough experienced captains and qualified coaches out there in the greater derbyverse, specifically those not in the WFTDA but use its insurance, for the new protocol to do more good than harm. 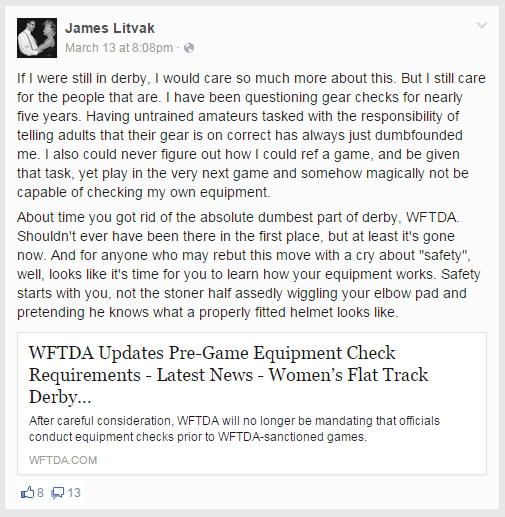 The WFTDA clearly thinks this is the case, or otherwise it would not have OKed the change. But I wonder why the WFTDA is leaving this matter up to its membership and the individual leagues they skate for, rather than take charge and start doing more about it directly. It doesn’t leave officiating to chance, for example: The WFTDA goes out of its way to set up and support officiating clinics, and states in its rules that it be strongly encouraged for at least one Referee to be WFTDA Certified for any game played. Why not bring coaching clinics and safety certifications into the fold? The WFTDA could offer coaches training and programs that would allow the collective experience on coaching to be standardized, verifiable, and quickly updated through a central source. In the future, preferably the near future, we need be at a place where the WFTDA can “strongly encourage” leagues to have at least one WFTDA-certified coach on staff. A qualified coach would have full information directly from the WFTDA as to the latest developments in safety equipment, concussion protocols, and emergency procedures. This individual would then be able to pass that knowledge along to the skaters, who could focus more on skating (safely) knowing that both the WFTDA and their coach are doing all of the legwork in looking out for them—rather than knowing that the WFTDA is asking them to do all of the work alone. I would hope that something like this is a part of the long-term plan for the WFTDA. The do-it-yourself ethic of the organization has built wonderful things, but there are some things that should be left for the experts to handle. If the WFTDA is serious about safety, then it should start thinking about creating (and endorsing) a group of people that teach it just as well as they do skating. The WFTDA correctly recognized that referees were not the group to do this job. That’s a great start. Many thanks to Dave “KORfan” Schrader for the gear check photograph. See WFTDA rule 9.1 for the mandate, and rule 5.13.22 for the penalty. a) The Safety Protocol was released in September 2011. As of this writing, it needs updating to reflect the change to pre-game protocols. For example, safety protocol 4.6.2 still states that official gear checks are mandatory, which is obviously no longer true. b) USARS and the JRDA also abide by the WFTDA safety protocol for convenience of insurance reciprocity. For its part, the JRDA has gone on record that it will still keep mandatory pre-game gear checks in place, despite the change at the WFTDA. I have some personal experience with this, having worked at a for-the-public paintball facility. Read about The One Rule for playing paintball safely—and what happens when people break that rule—on Scratchpad, the Derby Notes Tumblr blog. A fact that the WFTDA completely misconstrued when it announced insurance enrollment and renewal for 2015. “The benefits and limits for the coverage have not changed at all,” it said. Liars.